Following his swearing in as chancellor on Janu­ary 30, 1933, Adolf Hitler and his Nazi Party began a policy of Gleich­schal­tung (synchro­ni­zation), where­by Ger­many would be thoroughly re­ordered along Nazi lines. With the Reichs­tag’s pas­sage of the En­abling Act on March 23, 1933, signed into law by German presi­dent Paul von Hinden­burg the same day, Hitler ruled by decree and the Nazi synchronization engine sprang to life. On this date, April 7, 1933, compliant Reichs­tag members passed the Civil Service Restora­tion Act (Berufs­beamten­gesetz), also known as the Aryan Act. This law reestab­lished a “national” and “pro­fes­sional” civil service and allowed tenured civil ser­vants, with few excep­tions, to be dis­missed at all three levels of gover­nment—national (Reich), state (Laender), and munic­ipal. Civil ser­vants who had opposed the Nazi Party and its anti­demo­cratic tactics and ideo­logies or who were not of pure Ger­manic descent (not “Aryans”; the term was defined the following week) were forced to retire. 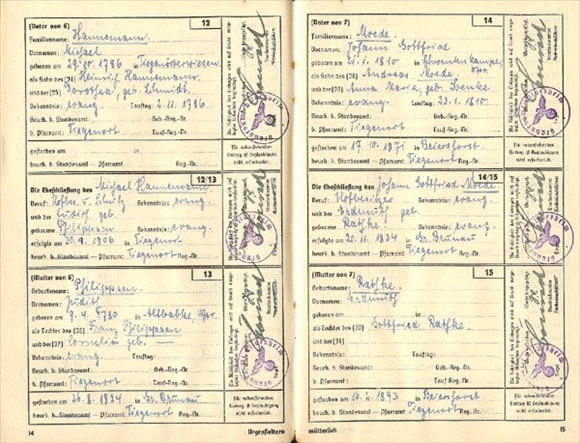 This meant that any­one who was suspected of being a politi­cal oppo­nent of the Nazis and any­one who was even a quarter Jewish (attested by the Arier­nach­weis (see below), the required gene­al­ogical proof of Aryan ances­try that intruded into all areas of life) could not serve as teachers, profes­sors, judges, or hold other govern­ment posts. Over a thou­sand Jews on the teaching staffs of German uni­ver­si­ties were abruptly cut off from their live­li­hoods. Shortly after­wards a similar law was passed covering lawyers, doctors, tax consult­ants, and public notaries. The Law Against the Over­crowding of German Schools and Uni­ver­si­ties placed limits on the number of Jews who could enroll or stay in state-supported schools. In September and October Jews were further excluded from working in cultural and enter­tain­ment occupa­tions, as well as in the field of jour­nalism. The raft of discrim­i­na­tory legis­la­tion directed against Jews culmi­nated in the 1935 Nurem­berg Laws (Nuern­berger Gesetze) “for the final sepa­ration of Jewry from the German Volk” (racial com­mu­nity). The areas of legiti­mate employ­ment open to Jews (Voll-Juden) and “Jewish mixed-breeds” (Misch­linge) dwindled to next to nothing. For the most part ordi­nary Germans accepted anti-Semitic legis­la­tion with­out protest owing to their deep respect for the law and their acceptance of Nazi racist ideology, us versus them. The visible ostracism and perse­cu­tion of Jews was ratcheted up with new legis­la­tion two years after Hitler had un­leashed his gen­o­ci­dal war in Europe. From Septem­ber 1941 the law obli­gated all Jews over the age of six, when out in public, to wear the Juden­stern, or “Jewish star.” Fines or impri­son­ment were im­posed on vic­tims who broke the law or hid the star in any way. The next month rail cars left the Nazi capi­tal for the East, the first in a series that carried thou­sands of Ber­liners to Jewish ghettos and labor and death camps in occu­pied terri­tories. Between five and seven thou­sand Jewish Berliners avoided deportation by “diving” (tauchen) underground. Above: An example of a Ariernachweis (Aryan Certif­i­cate), in this instance issued by the Stadt­pfarr­amt Boennig­heim (Catholic Parish Office of Boennig­heim) in the state of Baden-Wuerttem­berg. It certi­fied that the person had no Jewish parents or grand­parents. Beginning in April 1933 the Aryan Certi­fi­cate was required of all em­ployees and offi­cials in the public sec­tor, including edu­ca­tion, under the Civil Service Act. In an ironic example of the Act’s chilling and dele­te­rious effects on German aca­demics (to say nothing about the out­come of World War II), Albert Einstein, being Jewish, did not return to his post as profes­sor at the Berlin Academy of Sciences but extended his stay in the United States, becoming an Amer­i­can citizen in 1940. 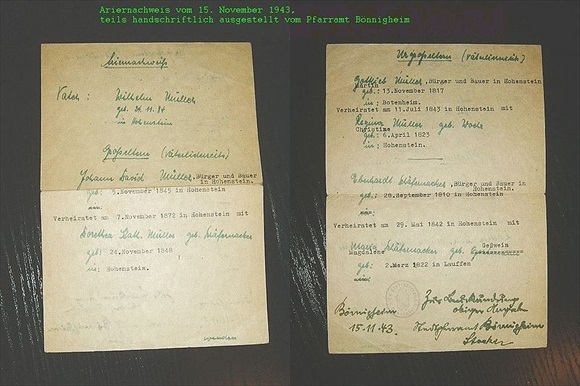 Out­side the German civil ser­vice, the Act’s Aryan para­graph was inserted into the statutes of many feder­a­tions, organi­za­tions, corpo­ra­tions, and real estate deeds, ultimately excluding Jews from all public life.